1On the McMillan Plan and the role of the Fine Arts Commission see Oliver p. 176. 2 These early discussions of the building are found in NAS-NRC Archives: Central File: P&E: Real Estate: Buildings: NAS-NRC: Committee on Building: Meetings: 1918, and NAS-NRC Archives: Building Records Group: ADM: Executive Bd: Committee on Building Plans: 1919-1922. 3 Regarding Goodhue’s conflict with the Commission, and Angell’s letter, see NAS-NRC Archives: Building Records Group: P&E: Real Estate: Buildings: NAS-NRC: Architect: Goodhue Bertram G: 1919-1920. 4 The construction of the building is described in the 1923-1924 NAS Annual Report, p. 3. 5 The building dedication is described in the 1923-1924 NAS Annual Report, pp. 3-4. The report also gives the first full description of the building’s interior. 6 The current number of Academy and NRC staff members is far larger than in 1924 when the NAS Building opened, and most NRC staff are now located in an office building at 500 Fifth Street NW, near Judiciary Square in Washington, DC. 7 A full description of the building’s exterior and interior architecture and art can be found in the 1923-1924 NAS Annual Report, pp. 4-7. 8 The term “Alexandrian” appears to have been first recorded by Gano Dunn in his “Memorandum to the Carnegie Corporation of New York on the Building Designed by Bertram G. Goodhue for the National Academy of Sciences and the National Research Council and Progress of its Construction,” 31 May 1923, in NAS-NRC Archives: Building Records Group: F&A: Finance: Funds: Grants: Carnegie Corp of NY: Building & Endowment Fund: 1919-1923. Wilson suggests that the term was meant satirically, holding that “Goodhue satirized the conservative classicists, claiming—through his employee, Wallace K. Harrison—that it could not be dated, it was ‘Alexandrian’ and ‘imprecise.’” Wilson (1989) p. 278 and Wilson (1991) p. 157. 9 Sculptor Lee Lawrie was born in Germany in 1877, and emigrated to the United States while still very young. He was closely associated with the streamlined modernism of the Art Deco style. His life as a sculptor began at age 14, when he worked in the studio of Richard Henry Park in Chicago. At 17 he went to New York, where he worked in the studio of Augustus Saint-Gaudens, considered by many to be the leading sculptor of his day. Lawrie’s first independent commission came in 1900, when he sculpted marble reliefs for the Pawtucket, Rhode Island Free Library. He taught at Yale School of Fine Arts from 1908 to 1919, and at the Harvard School of Architecture from 1910 to 1912. He worked with Goodhue on the Academy building and on the Nebraska State Capitol and several churches in New York. In addition to his architectural collaborations, he sculpted the portrait relief which served as the basis for John R. Sinnock’s design for the Roosevelt dime. His best-known work may be the Atlas in Rockefeller Center. Lawrie died in January 1963. 10 Like Lee Lawrie, Hildreth Meiere was associated with Art Deco modernism. Born in New York City in 1892, Meiere studied art in New York, California, Chicago and Florence, Italy, and worked as a mapmaker during the First World War. She was a muralist and painter, as well as a highly accomplished mosaicist. In 1923 she met Bertram Goodhue, who gave her her first major commission: Creating painted murals for the interior of the Academy building. Goodhue also worked with Meiere on the Nebraska State Capitol building, work for which she was awarded the Architectural League of New York’s Gold Medal in Mural Decoration in 1928. Meiere’s best-known work may be the metal rondels illustrating song, drama and dance on the exterior of Radio City Music Hall in New York. Meiere died in 1961. Her works, encompassing a variety of media and techniques, are found in civic and ecclesiastical buildings across the country. 11 See 3 Jun 1923 letter from Hale to Dunn, in NAS-NRC Archives: Building Records Group: P&E: Real Estate: Buildings: NAS-NRC: Great Hall: Artwork. 12 Painter and tapestry designer Albert Herter, founder of Herter Looms, worked with Goodhue on the NAS Building. Herter painted the Great Hall mural of Prometheus, the iconographic mural of Lincoln and the NAS founders in the Board Room, and the insignia of great universities in the Members’ Room. All of these were conserved during the NAS Building's restoration. 13 The quote from Aeschylus’ “Prometheus Bound” reads, "Hearken to the miseries that beset mankind. They were witless erst and I made them to have sense and be endowed with reason. Though they had eyes to see they saw in vain; they had ears but heard not. But, like to shapes in dreams, throughout their length of days without purpose they wrought all things in confusion. . . . They had no sign either of winter or of flowery spring or of fruitful summer, whereon they could depend, but in everything they wrought without judgment, until such time as I taught them to discern the risings of the stars and their settings. Aye, and numbers, too, chiefest of sciences, I invented for them, and the combining of letters, creative mother of muses' arts, wherewith to hold all things in memory. . . . Twas I and no one else that contrived the mariner's flaxen-winged car to roam the sea. . . . If ever man fell ill, there was no defence, but for lack of medicine they wasted away, until I showed them how to mix soothing remedies wherewith they now ward off all their disorders. . . . Hear the sum of the whole matter--every art possessed by man comes from Prometheus." 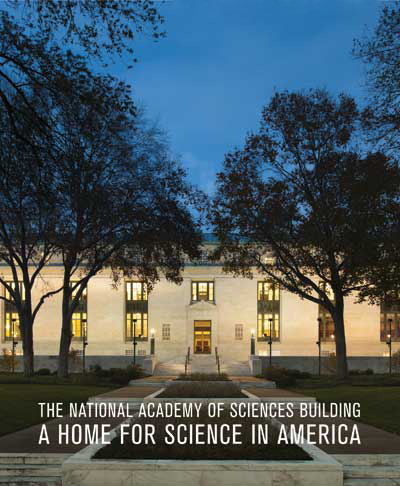 15 Attendance figures for the building’s first year were reported in the NAS Annual Report for 1924-1925, p. 1. Attendance for 1937 was reported as 57,283 in the NAS Annual Report for 1936-1937, p. 24. 16 For the size of the library in 1923, see Paul Brockett, “Memorandum Regarding Library for the National Academy of Sciences and National Research Council” (n.d. but ca. Sept 1921) in NAS-NRC Archives: Building Records Group: P&E: Real Estate: Buildings: NAS-NRC: Library: Construction: 1921-1923. For the storage situation, see the 1922 NAS Annual Report, p. xi. 17 For discussions of the Academy seal, see NAS-NRC Archives: Key Documents Records Group: NAS: Seal. 18 President Kennedy’s address to the 1961 NAS Business Session is documented in NAS-NRC Archives: Central File: ADM: ORG: NAS: Meetings: Annual: Business Session: Minutes: 1961. 19 On Herter’s portrait of Lincoln and the Academy founders, see: NAS-NRC Archives: Building Records Group: P&E: Real Estate: Buildings: NAS-NRC: Board Room: Art Work: Lincoln & Academy Founders: 1923-1924. 20 The decision in favor of wings is reported in the NAS Annual Report for 1958-1959, p. 1. 21 Harrison’s life and work are documented in Newhouse. 22 The West Wing’s funding by Equitable and projected use by the life sciences are reported in Cochrane p. 525. 23 On the relationship between the Caspary dome and the Academy auditorium, and the Harrison-Harris collaboration, see Newhouse p. 177. 24 Texts of the Presidents’ addresses to the NAS membership can be found in NAS-NRC Archives: Key Documents: External Relationships: Presidents of US.